Roundabouts are there to make our driving safer and simpler. ✅ Slow Down: You will generally see a yellow speed advisory sign when approaching a roundabout. Heed it. Because of the sudden change in inertia your car goes through when navigating a roundabout, it is much easier to lose control, especially on a wet road. ✅ Indicate on approach: If you’re not travelling straight ahead through the roundabout, you will need to indicate to show the drivers around you at what point you intend on leaving the round-about. This allows them to position themselves appropriately. ✅ Give way: When approaching a roundabout, unless it is controlled by traffic lights, you will see a give way sign. That means you give way to any cars approaching you. Simple. Q. In a multi-lane roundabout which lane should I use? (iii) If you’re turning right then you should use the right hand lane (unless arrows on the road dictate otherwise). (iv) If there are more than two lanes, there will generally be arrows painted on the road to indicate lane usage. Q. Can I change lanes in a multi-lane roundabout? A. Yes. As long as it’s safe to do so and you indicate. Q. Do I have to indicate when leaving the roundabout? A. If there is time it’s always good to indicate your intention to leave the roundabout. This lets everyone around you know exactly what your intentions are. Just be aware that indicating too early may lead to confusion. 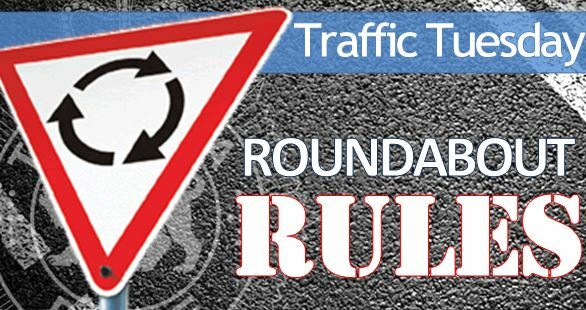 This page -- https://www.police.tas.gov.au/what-we-do/traffic-policing/traffic-tuesday/5-roundabout-rules/ -- was last published on December 6, 2016 by the Department of Police, Fire and Emergency Management.